Interested in mentoring the storyteller of tomorrow? Dodge College of Film and Media Arts has developed an Alumni Mentor Program to provide current students with the opportunity to be matched with an industry professional who will assist in the development of skills and perspectives that are necessary to succeed in the professional world. If you are interested in participating as a mentor or a mentee for the academic year 2019/2020, please email Career Advisor, Jon Hernandez (jonherna@chapman.edu). The vision of the Alumni Mentor Program is to provide an opportunity for Dodge College students to be matched with an industry professional in the Fall semester who will assist them as they develop the skills and perspectives necessary to succeed in their careers as well as providing a direct link between the classroom and professional world. The Alumni Mentor Program matches 3rd and 4th year undergrad, and graduate students with an industry professional who serves as a role model while providing guidance and direction to students. Working with an experienced professional can provide added meaning to the classroom experience as well as enhance business and career development. Mentors will have the opportunity to reflect on their business/profession through the questions and perspectives of today’s students as well as enjoying the opportunity to give back by working with the next generation of young professionals. The Alumni Mentor Program is not a placement program. The intent is not to open doors to specific job opportunities. Rather, it allows students to develop close relationships with prominent individuals who can share some keys to success while providing advice on what to do, when to do it, and how to do it. The mentors work with students in an informal setting to share their thoughts and experiences. To establish a collaborative, personal relationship. To acquire insight and understanding about a particular career or profession. To build a network and enhance career success. To become aware of the latest business practices and theories. To develop and enhance professional and communication skills. To create an opportunity to share experiences and impact future leaders. To develop personal mentoring and coaching skills. 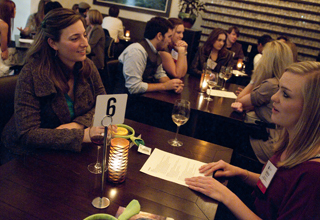 To expand your professional network. To reconnect with Dodge College of Film and Media Arts. It is voluntary and based on personal commitment. Mentors and students are matched on career goals, profession and industry. The partnership is sustained by both mentor and student. Expectations and benefits are clear to all participants. Commitment to make the collaboration work. Willingness to share and allocate time to meet or chat on a regular basis. Discipline to listen, understand and reflect. Have at least two years experience in the professional world. Commit to the time and communication requirement as mutually agreed upon between mentor and student (communication can take the form of in-person meetings, phone/Skype calls, or email exchanges). At a minimum, there should be an in-person meeting once a semester and monthly phone or email exchanges. Be open minded, respectful and keep to the expectations that have been set out for the mentor/mentee relationship. Be a junior or senior undergraduate or in a graduate program. Have a minumum 3.0 GPA in their major. Complete survey and feedback forms at various intervals throughout the year. A selection committee comprised of Dodge College representatives, faculty, and alumni will review both student applications and mentor profiles. The “matching” process will be based on career goals/interests of student and the professional experience of the mentor. Dodge College will notify all applicants of the matching results. Students are responsible for making the first contact with their assigned mentor and there will be a scheduled dinner held by Dodge College for the initial meeting in October. In some cases, based on the criteria above and/or a lack of suitable matches, a prospective mentor or mentee may not be matched. Files on prospective mentors or mentees not matched will be reviewed for a match during the next program cycle.